GM deal 'a black day' for Canada's auto sector: One of the key pillars supporting Canada's long-standing competitive advantage in the auto industry began crumbling Wednesday, less than a week after another one collapsed. GM will transfer its $51-billion (U.S.) retiree health care obligation to a trust, called a Voluntary Employees Beneficiary Association or VEBA, and finance it with a cash infusion of about 70 cents on the dollar or $36-billion. That move will trim its average labour costs – including benefits – by about $18 or $19 an hour, Deutsche Bank AG auto analyst Rod Lache estimated. Average hourly U.S. labour costs will fall to about $55, close to the $48 that Japan-based auto makers are estimated to pay their U.S. workers. The notion that the US arm of GM has suddenly become more competitive comes from not understanding the difference between marginal and average costs. 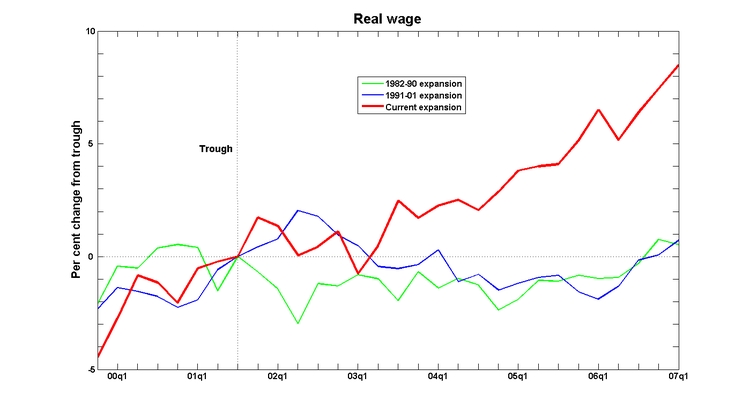 That $19/hour is not disappearing; it's being capitalised and written off as a dead loss. Marginal costs - what it costs to actually produce an extra car - are what matter, and those haven't changed. CAW economist Jim Stanford described shifting the retiree health-care burden to the union as simply a shell game. The U.S. auto makers will still be paying for the health care of their active employees, Mr. Stanford pointed out and retiree health costs are irrelevant when it comes to deciding where investments are made. Jim Stanford has it right. Too bad the story wasn't written from that perspective. Mark Thoma is following the lead of Brad DeLong (among others) and has started recording his lectures. This is of course a very good idea, and I hope that the trend will continue. But it's not for me - I lecture in French. "But Stephen," some of you may be asking, "isn't that awfully anglo-centric of you? There are 300 million French-speakers out there. They might get something out of your lectures." Yes, indeed they would: that's precisely the problem. For example, there's the case of my lecture on conditional heteroskedasticity (lecture notes available here: pdf). I had determined that the proper translation of 'fat-tailed' distributions was 'queues épaises'. But I never realised that I was mispronouncing it until a student took pity, and informed me that I had been talking about 'fat-assed distributions'. For five years. Update: It gets worse. My wife informs me that I didn't even get the translation right; it should have been 'queues épaisses'. I can understand that the Toronto Star's editorial board has fallen victim to the Manufacturing Obsession, and that it feels obliged to make the case that the interests of seven people who work outside the manufacturing sector are as nothing before those of a single Manufacturing Worker. But I can't understand why it thinks that The Cause will be helped by calling on the Bank of Canada to lower interest rates in order to bring the exchange rate back down. 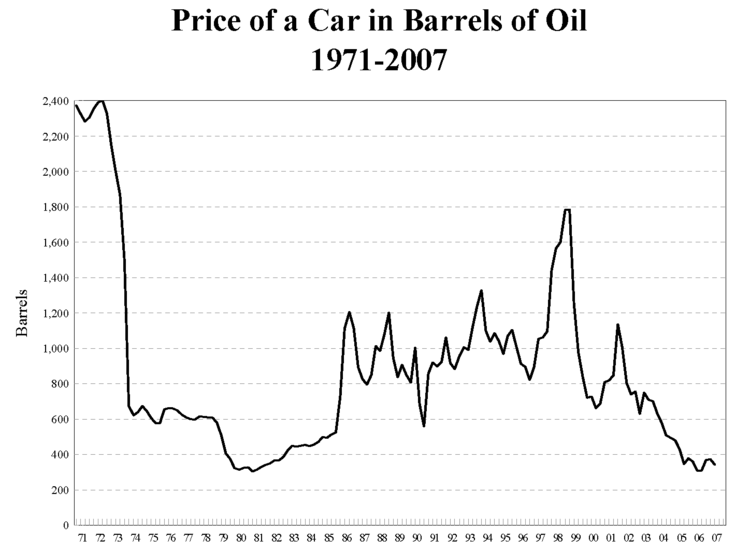 During the past 5 years, the price of automobiles relative to oil has decreased by about a factor of about three. If you were in the business of producing cars and oil, then the appropriate response to this kind of a relative price shift is to re-allocate productive resources away from cars and into oil. And that's what has happened, to the general benefit of Canadians. (See also this). But if sustained real wage growth and record employment rates are part of a package that involves a smaller fraction of the work force employed by the manufacturing sector, then The Star wants no part of it. If relative price movements are the cause, then by golly, The Star will do all it can to get influence public policy so that those relative prices go back to where they were. Except that it's choosing the wrong relative price as a focus for policy. Suppose that the Bank of Canada did decide to abandon inflation targeting in order to lower the CAD-USD exchange rate. Manufacturing exports would become more profitable. So would energy exports. A lower exchange rate would have no effect on the trends that are leading to a transfer of productive resources out of the manufacturing sector. Economists appear to live in a world that is one time derivative higher than the one that governs MSM economic commentary. The real story is the change in the exchange rate, not its level. Update: For another example, see this post. Now that the Fed has cut its interest rate by 50 bps, it's time to start speculating about what the Bank of Canada will do on October 16. It should be noted that the Bank is dealing with a very different problem than the one facing the Fed. Indeed, it's facing a problem that the Bank of Canada hasn't seen before. Core inflation came down a bit to 2.2% y/y in August, but it's been above the 2% target for more than a year now. Moreover, the Bank's measure of the output gap has been positive for at least a couple of years. Put them both together, and it's easy to understand why the Bank's bias is towards increasing interest rates. The only reason they wouldn't would be is if it thought that inflation would come down on its own. The run-up in the CAD-USD exchange rate will slow inflation a bit, but its effect will be modest. The real issue is the extent to which a slowdown in the US will reduce inflationary pressures here. In previous expansions, the answer would have been "a lot, and soon", so the Bank could be expected to follow the Fed's lead. But things are different this time. Exports (in practice, this means exports to the US) were the driving force behind the 1982-1990 and the 1991-2001 expansions, but they've been a drag on growth in the current expansion, growing only about 2/3 as fast as GDP. The main source of growth has been domestic demand. Even so, a US slowdown that had the effect of reducing Canadian exports would still bring down inflation. But again, things are different this time, notably the composition of exports. A US recession can still be expected to reduce manufacturing exports, but manufacturing exports are being displaced by energy exports. In previous cycles, this wouldn't matter: a US recession would also reduce oil prices, so Canadian exports would fall anyway. But oil prices are not following the usual script: the US' share of world demand is falling, and world oil supplies are tightening. Even though expectations of a US slowdown are widespread, oil prices are still going up. It may well be that US oil demand will fall, but it will show up as a reduction of oil imports from overseas rather than from Canada or Mexico. So it's not at all clear to what extent a US slowdown will attenuate inflationary pressures in Canada, which makes the Bank's next move harder than usual to predict. Right now, my expectation is that they will hold off on their tightening bias and keep interest rates steady. If things worsen in the next few months, they'd be forced to reverse an October increase, and the Bank doesn't want to become a source of volatility in the financial markets. Nor do current conditions warrant a rate cut (here I am pointedly ignoring this foolishness): a decision to reduce interest rates would have to be based on the arrival of bad news between now and October 16. FTA/NAFTA: The treaty and the 1988 election upon which it was largely based occurred when I was in grad school. At the time, my impression of the general consensus among economists was that the FTA was on the whole a good idea (we understand the theory of comparative advantage), but that it wasn't all that big a deal. The US and Canadian economies were fairly similar, and already highly integrated: all the low-hanging fruit from the gains to trade had been pretty well picked over. And that consensus pretty much characterises what actually happened. The canonical study of the effects of FTA/NAFTA on the Canadian economy is Dan Trefler's 2004 AER article (26-page pdf), which concludes that its effects were - after a not-inconsiderable period of adjustment - small and positive: "a 3-percent rise in earnings spread over eight years will buy you more than a cup of coffee, but not at Starbucks." Nor is this view confined to the ranks of trained economists: public opinion polls suggest that 70% of Canadians support NAFTA. Small wonder it has survived five federal elections since then. The GST: If you asked a specialist in public finance how best to raise tax revenues without tanking the economy, the answer would be 'Consumption taxes. Theory suggests that these are the least harmful to economic growth, and available evidence supports the theory.' This advice would be accompanied by the caveat that consumption taxes are regressive; it would be a good idea to implement a program of direct transfers to low-income households in order to compensate. I haven't read Mulroney's memoirs yet, but I'd be surprised if the decision to set up the GST didn't follow this scenario. The GST has never been popular, but it too has survived five elections. Sadly, it was wounded in the aftermath of the Conservative victory in 2006, when it lost a percentage point. But the GST credit survives - and is still the only federal targeted transfer program aimed at supplementing the incomes of low-income households. Inflation targeting: Strictly speaking, this was a decision taken by the Bank of Canada, but Mulroney's government lent whatever credibility it could to the project. Implementing it was a painful process - the recession of the early 1990's was a brutal affair - to Kim Campbell's and John Crow's cost. But again, this policy is still in place after five elections - and inflation has fluctuated in a narrow range around 2% for some 15 years. Fiscal Policy: Although the Liberals - and Paul Martin in particular - get pretty much all the credit for finally conquering the federal government deficit, they really only deserve about half of it. As documented here, slaying the deficit dragon required transforming an operating deficit of -3% of GDP to a surplus of 6% during the period 1984-2000. The Mulroney government turned the -3% deficit into a 2% surplus before the 1991-2 recession brought it back down again. The Liberals are to be congratulated for finishing the job - but then again, they were the ones who had created the problem in the first place. Scrapping the NEP: As explained here, the National Energy Policy amounted to a transfer from producers of oil to consumers, with a significant amount of deadweight loss along the way. Since the Trudeau Liberal govt of the time had broad support among the winners and almost no support among the losers from this transfer, they had few qualms about efficiency losses. Similarly, it's unlikely that Mulroney had those efficiency losses in mind when the NEP was abolished: he was rewarding his base. Notwithstanding, the efficiency losses were removed. These programs generated significant adjustment costs. It was Kim Campbell's sad fate to pay the electoral price for them, and Mulroney has played the role of piñata in numerous accounts of the history of those times. But his government can fairly claim to have either implemented or to have set the foundations for the policy mix that has made Canada's one of the world's best-performing economies in recent years. *For non-Canadian readers: Brian Mulroney was Prime Minister between 1984-1993.
Who would think that economic history and the history of economic thought are not part of economics? The Australian Bureau of Statistics, that's who. We urge you to reconsider the decision to “relocate” “economic history” and “history of economic thought” into the “History, Archeology, Religion and Philosophy” category of the Australian Bureau of Statistics. Such a relocation will carry with it serious implications for tenure, promotion, and research support for economists who work in the history of economic thought and economic history. Looking to the future, this decision will mean that fewer professors will be versed in the historical approach to economics. The result will be costly both for the economics profession as a whole and also for the students we teach. The history of economic thought has always been an important component of the literature on economics. It has shown the richness of the roots of economic theory and provided a base for the debate and discussion of the competing schools of economic ideas. A relocation of the History of Economic Thought and Economic History will privilege technical approaches over the literary approach. We suggest that economics needs both approaches. Senior figures in the profession accept this. At the 2007 History of Economics Society annual conference, Nobel laureate, James Buchanan gave the Distinguished Visitor Lecture, “Let Us Understand Adam Smith”. That lecture will be published in the Society’s journal, Journal of the History of Economic Thought¸ published by Cambridge University Press. It should be noted that a second Nobel laureate, Vernon Smith, was on the 2007 HES conference program as well and that Vernon Smith has also given the HES Distinguished Visitor Lecture in the past. In recent years the mathematical and quantitative sides of economics have been emphasized at the expense of areas such as the history of economic thought. There is, however, much evidence of growing interest in the History of Economic Thought and Economic History as research areas at the graduate level. The Society supports a young scholars program at its annual conference; each year, the number of applications increases and we now receive many more applicants for support than we can fund. As additional evidence that senior members of the economics profession support the historical approach, we note that Nobel laureates Kenneth Arrow, Ronald Coase and Paul Samuelson welcomed the establishment of the European Journal of the History of Economic Thought in 1992 and Paul Samuelson is a member of the editorial board of the journal. The major history of economic thought journals, EJHET, HOPE, and JHET, all publish fine scholarly articles and have included contributions by Samuelson, Buchanan, Debreu, Klein, Solow Simon and Arrow. Though the point is obvious, we cannot emphasize enough that these are senior economists, as opposed to researchers in “Philosophy, Religion, and Culture”. Though there are of course writers in these latter areas who also take an interest in the history of economic ideas and economic history, our strength lies primarily within the economics discipline, itself. The case must be also made for continued support of the Economic History and History of Economic Thought on the basis of the mission of teaching undergraduate economics majors. The typical economics professor today has had little training in moral reasoning or civic engagement, and his or her interests are narrowly defined by formal modeling and statistical testing. This means that the economics major – absent the historical approach – is becoming less and less appropriate for students interested in business or public policy. At the undergraduate level, economics students increasingly become familiar with techniques they rarely understand. At the national level in the United States, the Association of American Colleges and Universities (AAC&U) has strenuously made the case for increased breadth in our undergraduate education. An education in economics that includes room for historical approaches to economic thinking, falls squarely within the AAC&U recommendations and offers students opportunities for applied moral reasoning and policy analysis. Indeed, if we to lose EH and HET as part of economics, we can expect that a professoriate trained with PhDs in economics will find it difficult not only to teach economics majors, broadly conceived, but also to communicate economic ideas to students in introductory courses who are there to meet general education requirements. The resulting increased narrowness of graduate training in economics will make it even less likely that new PhD’s will be able to teach introductory courses that have the breadth and context to reach students who aren't necessarily interested in the major but who wish to learn economics as part of a liberal education program. As a consequence, the economic literacy of the citizenry itself will suffer. For all these reasons, we urge you to reconsider your decision. Maria Cristina Marcuzzo, HES Executive, Direttore del Dipartimento di Scienze Economiche Università di Roma "La Sapienza"
When I last taught econometrics - some 10 years ago - there was a practical reason for why Bayesian methods played little or no role in the textbooks. Even though classical methods asked the wrong questions* and forced people to wade through a myriad of complicated and contradictory ways of answering them, it was at least possible to extract point estimates from the data. A practitioner who wanted to address problems more complicated than the linear normal regression model would find that Bayesian methods had very little to offer in the way of concrete advice, so she could be forgiven for concluding that spending time on them was pretty much pointless. Bayesian methods are best adapted to the questions of most interest, and are easier to use. Unfortunately for the next generation of economists, this perspective has yet to significantly infiltrate how econometrics is taught. a) Probability statements about an observable statistic, conditional on an unobserved feature of interest. b) Probability statements about an unobserved feature of interest, conditional on an observable statistic. If you answered a), then you are God - or perhaps one of the lesser deities who is bored with just knowing The Truth, and is looking to make some extra cash by betting on what statisticians will conclude from what Nature draws out of its urn of coloured balls. But if your fate is to live among mortals, knowing only what mortals can learn, then b) is the only question that is worth spending time thinking about.